The seed of the breadseed poppy (also called opium poppy) contains several alkaloids, namely morphine, codeine, noscapine, papaverine, and thebaine, among others. The milky juices that bleed from a cut in an unripe breadseed poppy seed are collected and dried to make opium - which is a highly addictive drug on its own, as well as a precursor to heroin other strongly narcotic drugs. It is also the primary source of morphine, which, as an analgesic, acts directly on the central nervous system to suppress the feeling of pain. Alkaloids in general have a wide range of applications both in traditional medicine and in modern medicine. They can not only be analgesic, but also anti-asthmatic, anti-bacterial, or cure dysentery and diarrhea. Many alkaloids are also highly addictive and toxic. Both morphine and codeine are strong pain killers, and codeine is used in modern medicine as a cough suppressor and to tread diarrhea. Thebaine is a pain killer that is chemically similar to morphine and codeine, though its effect is stimulating rather than tranquilizing. 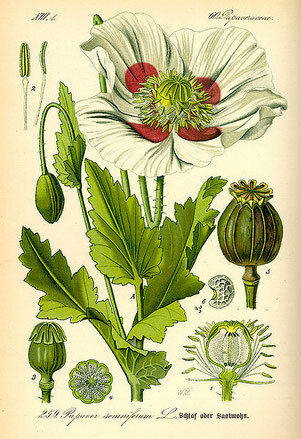 Papaverine and noscapine have antispasmodic (cramp-relieving) and cough-suppressing effects, respectively. The combined effects of its ingredients makes breadseed poppy a powerful - if dangerous - tool in an herbwoman's arsenal. Extreme caution in its use is imperative, but in the absent of modern synthetic analgetics, it is the one remedy an herbwoman has that will work against debilitating pain. Since opium, the drug won from the unripe seeds of the breadseed poppy, is a restricted substance, the plant is not used in modern herbal medicine per se. 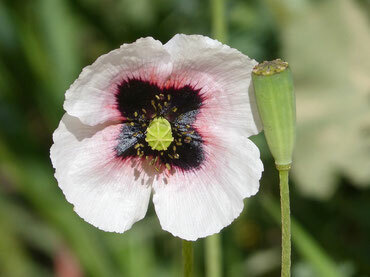 However, Wikipedia states that it is the primary source of morphine, and several other alkaloids contained in its seeds are refined from the breadseed poppy, as well. Wikipedia also has articles on the different alkaloids contained in opium, e.g. morphine, codeine, and thebaine, as well as opium itself. In her novel "Once Upon a Marquess", romance author Courtney Milan's hero fights his addiction to laudanum, i.e. tincture of opium. Laudanum is an often-cited remedy in many other historical romances, as well.